Scientists from NJIT's Center for Solar-Terrestrial Research are providing some of the first detailed views of the mechanisms that may trigger solar flares, colossal releases of magnetic energy in the Sun's corona that dispatch energized particles capable of penetrating Earth's atmosphere within an hour and disrupting orbiting satellites and electronic communications on the ground. Recent images captured by the university's 1.6-meter New Solar Telescope at Big Bear Solar Observatory (BBSO) have revealed the emergence of small-scale magnetic fields in the lower reaches of the corona the researchers say may be linked to the onset of a main flare. The study also includes the first scientific contributions from NJIT's newly commissioned Extended Owens Valley Solar Array (EOVSA). "These smaller magnetic fields appear as precursors to the flare by reconnecting with each other - breaking apart and forming new connections - in an already stressed magnetic environment. This sets the stage for a larger energy release," notes Haimin Wang, distinguished professor of physics at NJIT and the leading author of a paper published this week in the magazine Nature Astronomy. The study, funded by the National Science Foundation and NASA, was conducted in collaboration with colleagues in Japan and China. "Through our measurements, we are able to see the emergence of fine magnetic channel structures prior to the flare, which contain mixed positive and negative magnetic polarities," Wang adds. "We then see a strong twist in the magnetic lines that creates instability in the system and may trigger the eruption." While solar flares are generally believed to be powered by what is known as free energy - energy stored in the corona that is released by twisting magnetic fields - the authors suggest that the build-up of coronal energy in the upper atmosphere alone may not be sufficient to trigger a flare. In their study of a prolonged flare on June 22, 2015, they observed in unprecedented detail the emergence in the lower atmosphere of what they call precursors, or "pre-flare brightenings," in various wavelengths. There are well-documented periods in which flares occur more frequently than the norm, but it has been difficult thus far to determine exactly when and where a particular flare might be initiated. The BBSO's recent study of a flare's magnetic evolution, enhanced by simultaneous microwave observations from EOVSA, has been able to pin down the time and location of the magnetic reconnection prior to the flare. 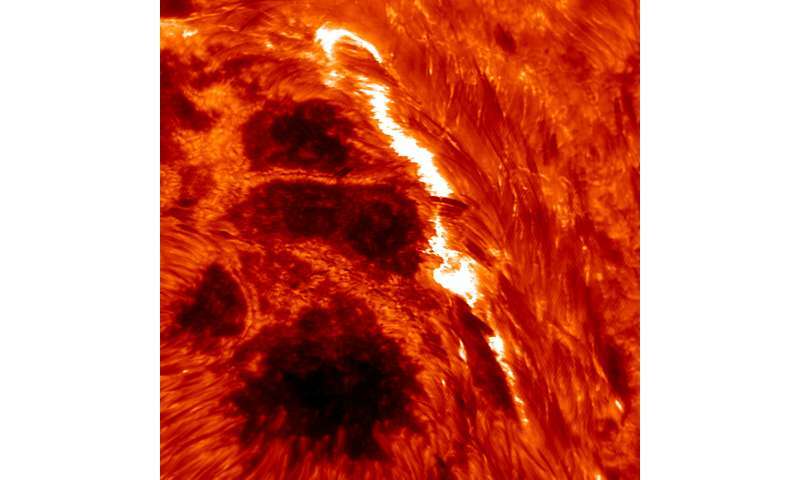 "Our study may help us predict flares with more precision," Wang says. A co-author of the article, Kanya Kusano of Nagoya University, compared BBSO's observations with his numerical simulation of the triggering process of solar flares. "I found that the observational result is very well consistent with the simulation," he notes. "This clearly indicates that these mixed-polarity magnetic channel structures are typical of the stressed magnetic field that triggers solar flares." "This clearly indicates that these mixed-polarity magnetic channel structures..."
That's what one might call an electric current, in techno-speak. then why don't the plasma physicists writing the study call it that? maybe because there is a difference and plasma physicists are being very, very specific? Ya know Stumped, you Kill yourself every time you say Nazi Sympathizing, because EVERYBODY knows, by just that, that you are ONLY trying to make somebody upset by misrepresenting what they say. You are WAY wrong with nearly every facet of your knowledge about dark matter, plasma and the way you toss around the term Pseudo Science is Just like the people that naysayed Galileo and Copernicus, Tombaugh and Even Einstein, until they proved everyone else wrong with undeniable proofs. Such new proofs have already come out that kill Dark Matter, and the major dark energy is Magnetics. You should know by now that the first person in an argument to bring up the nazis is the AUTOMATIC loser? "These smaller magnetic fields appear as precursors to the flare by reconnecting with each other - breaking apart and forming new connections - in an already stressed magnetic environment. This sets the stage for a larger energy release"
oh no! that dang magnetic reconnection happened again, CantDrive! But, if it is an electric current like you say, we should be able to see the magnetic fields around these currents change as the electric currents increase or decrease, right? this coming from someone who can't produce any evidence at all whatsoever refuting the studies, links and references that i've provided in the past? the first person ...to bring up the nazis is the AUTOMATIC loser? The tight spiraling filaments are the electric currents, the plasma trapped in the magnetic fields they create trace out the phenomena. The most obvious indication the current density of the electric currents increases is they achieve arc mode discharge.